Back when Apple was just starting to find its footing after a brush with death, management realized that it had no real control over how potential customers experienced its products. The Mac still had a lot going for it despite years of mismanagement. Those advantages were lost amid really poor retail executions. Mac displays were always poorly assembled, and the sales people in computer stores didn't really like Macs. Customers were consistently steered away from the Mac section toward something the salesperson was more comfortable with. I can remember going to Sears with my dad to pick up a computer when I was in high school. This was a few years before Steve Jobs returned to Apple, and the company was in rough shape. I started programming in grade school, and designed networks in middle school. This made me different from a typical computer shopper, and in many ways I was a computer salesperson's worst nightmare: a know-it-all teenager. True to form, our salesman was determined to point us away from the Macs. I took this as an obvious opportunity to convert him to the Apple Cause™. The poor guy! All he wanted was a commission on a sale and I wouldn't leave him alone. I told him about the differences in the memory model of a Mac vs DOS/Windows. I told him about plug and play, and the lack of a shell underneath the GUI. I preached the most powerful computer sermon of my life. We bought a Mac. 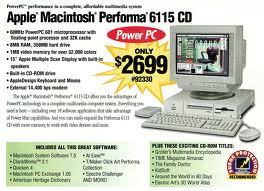 A Performa 6115 CD. You graybeards know what I'm talking about. It was a rebranded Power Mac 6100/66 that included a display and some software. I talked my dad into a 486-based DOS card so we could run Windows too. I over clocked the CPU and loaded the thing up with RAM. I learned more from that single machine than any thing before it or since. It would have never happened if Dad went alone. The salesman would have talked him into a PC. This experience should have told me Apple wasn't crazy to open its own stores. They'd worked on the store-within-a-store concept, and it helped enough to stop the bleeding. More still had to be done. Most people didn't even consider Apple products when buying computers. The whole world thought Apple was insane to open stores. I had my doubts as well. They were just getting on solid ground financially. Other computer companies' retail efforts were dismal failures. Remember Gateway Country? But it worked. Apple Stores propelled the company to new heights, and they remain a critical factor in keeping momentum. Apple makes great products, sure. But Apple Stores give millions of people the opportunity to experience those products at their best. That matters more than ever now. Apple's utter dominance of multiple industries has created an environment where their partners fear them. Apple executes on such a consistent basis that it is a threat. How much leverage to record labels have in negotiating? What about cell phone carriers? It should come as no surprise that AT&T and Verizon are both steering customers away from the iPhone. The iPhone represents an incredible portion of the smartphone sales for both those carriers. They don't like it. They chafe under the influence Apple has over them. The carriers hate to see the share of their revenue that goes back to Apple as a phone subsidy. Apple wants to own the customer relationship. They want to own support. They also won't let the carrier dictate the features, branding or ad model of the handset. Every bit of marketshare Apple gains represents a loss of control for the carrier. That's great for customers, but terrifying for a business. Imagine what would happen if Apple didn't have stores. What defense would they have? Apple does have stores. Those stores sell a lot of iPhones. The people buying those iPhones tell their friends how much they love them and now the carriers have to contend with millions of users who come in and say "I want an iPhone."